When users access to donation form to process donation, they can choose to make one time or recurring donation. Joom Donation allow you to add unlimited campaigns and track donation progress for each campaign. You can create un-limited custom fields to collect more information about donors. Custom fields can be assign to specific Donation Campaigns. Donors can process donation not only on PC, Laptop but also on Mobile devices such as Iphone, Ipad, smart phones. Receive donation easily through many different payment options. All Email messages can be configurable from back-end of Joom Donation. Support various modules like Donation Thermometer, Donation Campaigns, Donation Form etc. Nice looking Dashboard allows you to quick access to important functions of the extension and also view latest donors, flexible Configuration and much more power management tools. Joom Donation is easy to set up and manage. When donor access to Donation form, they can choose to make one time or recurring donation. The donation form is configurable. You can choose to show/hide, required/not required any fields on the form. You are able to create custom fields to collect more information about donors. You can define pre-defined amounts for donation form. When donor make donation, they can choose from one of pre-defined amounts or enter specific amount into Amount field. You are able to setup minimum and maximum donation amount for each donation transaction. For recurring donation, donors can choose Frequency (Daily, Weekly, Monthly, Annually) and number of recurring payments (or unlimited). Donors can choose the payment gateways they want to use (in case you have multiple payment gateways available). 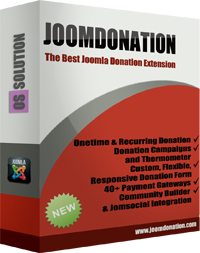 Donors can view their donation history through layout Donation History of Joom Donation component. You also can show list of donors (on a module) or on a page by creating a menu item to link to Donation History view of Joom Donation. Donors can choose to hide himself from donor list of they want (just check on anonymous donation checkbox on donation form). You can set GOAL, STARTDATE, ENDDATE and description for each campaign. You can track how much money each campaign has received anytime you want. There is also nice thermometer to show the progress of each campaign. Each campaign can have it own pre-defined amounts. Campaigns feature is optional. You don't need to use it if you only want to have simple donation form. You can choose which fields are showed/hided, required/not required on donation form. You are able to create un-limited custom fields to collect more information about donors (beside the basic core fields like First Name, Last Name....). Each campaign can has it's own set of custom fields. Building on twitter bootstrap framework, Joom Donation is now responsive. That mean donors now can process donation through PC, Laptop and Mobile devices. Notification Emails sent to administrator when someone make a donation. Confirmation Emails sent to users when he completes donation. The most popular payment gateways: Paypal, Authoroize.net, Offline payment plugins come with the extension by default. Other payment gateways such as 2Checkout, Authorize.net SIM (Server integration method) ,Google Checkout, First Data, iDEAL Mollie, Stripe, PayU Latam .etc are released as separate payment plugins. See Payment Plugins tab to see list of available payment plugins. Nice looking Dashboard allows you to quick access to important functions of the extension and also view latest donors. Easy to Create and Manage Donation Campaigns. Manage donors (find, edit, delete, approve donation record) simply. You can also create donors manually from back-end. Export donors into a CSV file. Install, change settings of the payment plugins which you use. Change, language strings (without having to edit language files directly) and translate it to different languages (if your site is multilingual). Latest Donors, Top Donors, Random Donors module. Campaigns module list all campaigns, what is the GOAL and how much money that campaign has received, allows users click on Donate button next to each campaign to process donation form that campaign. Thermometer module allow you to see the progress (Goal, Donated Amount, Percent processed) of a campaign. Users can then click on the donate button displayed under the thermometer rto process donation. Content plugin to display donation form in a Joomla article. Joomla Profile, Easy Social, Easy Profile, Jomsocial and Community Builder: Auto fill-in donation form with data stored in user profile. Also there is a donation history plugin allows displaying registration history of a user in his profile. Integrated with newsletter extensions such as AcyMailing, Acajoom, CCNewsletter so that when users make a donation, they will be assigned to mailing list and you can send emails to it later. Open programming structure so that you can easy write plugins to integrate with third party extensions. This version fixed a medium level security issue which happens with PayPal payment plugin. In older version, PayPal payment plugin has a bug which allow dis-honest users with certain level technical skill can pay for the subscription using different currency with the currency you set for your system, thus paying lower price for the subscription. This plugin allows you to use Eway payment gatewayfor processing payment in Joom Donation extension. This plugin allows you to use FirstData payment gatewayfor processing payment in Joom Donation extension. This plugin allows you to use Alertpay payment gatewayfor processing payment in Joom Donation extension. This payment plugin in allows you to accept payments via Authorize.net SIM (server integration method)payment gateway in Joom Donation extension. This payment plugin in allows you to accept payments via Securepaypayment gateway in Joom Donation extension. This plugin allows you to use Payway payment gatewayfor processing payment in Joom Donation extension. This plugin allows you to use iDeal Molliepayment gateway for processing payment in Joom Donation extension. This plugin allows you to use PagSeguro (a Brazil payment gateway) payment gateway for processing payment in Joom Donation extension. This plugin allows you to use Sagepay (http://www.sagepay.co.uk) payment gateway for processing payment in Joom Donation extension. This plugin allows you to use Stripe (https://stripe.com/) payment gateway for processing payment (one time and recurring) in Joom Donation extension. This plugin allows you to use Paygate (https://www.paygate.co.za) payment gateway for processing payment in Joom Donation extension. This plugin allows you to use CCAvenue (http://www.ccavenue.com) payment gateway for processing payment in Joom Donation extension. This plugin allows you to use FirstData Payeezy payment gatewayfor processing payment in Joom Donation extension. This plugin allows you to use Braintree payment gateway (https://www.braintreepayments.com) for processing one time payment in Joom Donation extension. This plugin allows you to use Payfast (https://www.payfast.co.za) payment gateway for processing payment in Joom Donation extension. This plugin allows you to use PayU Latam (http://www.payulatam.com/) payment gateway for processing payment in Joom Donation extension. This plugin allows you to use Sofort Überweisung (https://www.sofort.com/) payment gateway for processing payment in Joom Donation extension. This plugin allows you to use CardSave (https://www.cardsave.net/) payment gateway for processing payment in Joom Donation extension. This plugin allows you to use PayUmoney (https://www.payumoney.com/) payment gateway for processing payment in Joom Donation extension. This plugin allows you to use Squareup (https://squareup.com/) payment gateway for processing payment in Joom Donation extension. CB Donate Me is a Community Builder plugin developed by Ossolution Team to allow your site visitors to donate for a member while viewing profile of this member in CB. JS Donate Me is a JomSocial plugin developed by Ossolution Team to allow your site visitors to donate for a member while viewing profile of this member .